On this page, you will find student work to spark the idea for a lesson. See some of the completed lesson plans for How-to's. General Materials: Moist Clay , Wire End Clay Tool Set , cloth to cover table, boards for supporting in progress projects, Rolling Pins and guide sticks (for slab projects), Glazes , Underglazes , Brushes . Alternate finishes of paints and stains may be used on some projects. Start with a hollow form built around newspapers. Newspaper can be removed before firing or can be left in (will burn out in the firing). Keep body forms hollow. Make sure there is air passage between body and head. Thick areas can be poked with a needle on the under side to aid in firing (this will prevent blow-ups). Students should experiment with different textures. This project can be done with Sculpey, Model Magic or self hardening/air dry clay. 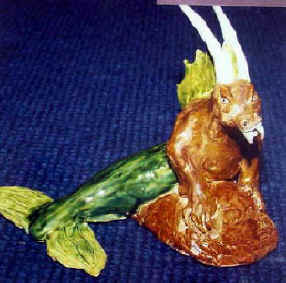 Linda had a third grade student make a wonderful Mermaid for her animal effigy unit. Top left and bottom right are samples that Linda made- the other two are student works. I have my kids draw an animal from observation, or bring in a photo of a pet to draw. They draw as realistically as possible, especially focusing on detail and musculature. Then they lay a piece of Tracing Paper over the top of their drawing and cross section it in the way they will build it. For example, which parts could be made from pinch pots, coils, slabs, etc. 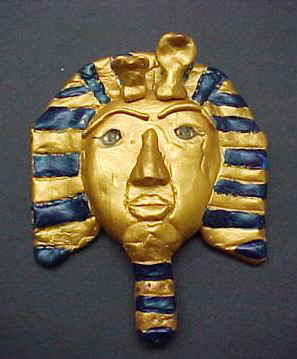 I teach them to use coils to build the eyelids, four balls of clay together in a cross formation but smoothed into the face on the outside edge of each ball forms an "anchor" shaped mouth and nose for animals like dogs, cats, rabbits, and so many others that have that little line coming down from the nose and then curving out into the lips/mouth. We talk about how they can shape the pinch pots further in their hands to push out where the thighs are or shoulders, or how they can add coils smoothed into their pinch pots to build up an area of muscle or a detail. We talk about texturing, and of course, the air vents need to be diagrammed in their drawing so I am sure that they understand their importance and when to add them. (For any clay curious types out there who don't build with clay enough to know, anything hollow and closed with no air vent will explode in the kiln.) We use paper towels to stuff the forms while we build them if necessary. Then they cut away an area of the body when the clay begins to stiffen enough, pull out the paper towels, and replace the body piece they removed to create the opening. I'm always so pleased with the way these turn out, and the kids learn so much about hand building in this lesson. Clay must be thoroughly covered up with a plastic bag to keep it from drying out. This applies to works in progress and moist clay. Clay dust can be harmful if you are exposed to it for long periods of time, so keep your area clean, clay scraps off the floor and clean with water and a sponge. Clay can be no thicker then your thumb. In order for clay to stick together it MUST be scored and slipped together while the clay is moist or leather hard. Wedge clay to remove air bubbles, achieve uniform consistency, and to line up the particles of clay. Trapped air can cause clay to explode. So hollow out sculptural forms and put needle holes from the bottom so air can escape. Don't glaze the bottom of a piece. NEVER HANDLE ANOTHER PERSONS WORK EVEN IF IT LOOKS COOL! 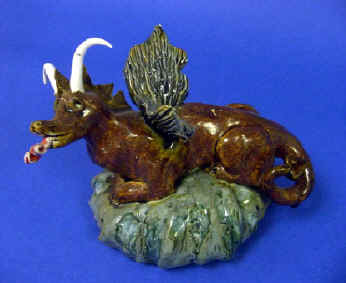 From Patti: I have used air dry clay to make pinch pot type gargoyle heads with my 5th graders last year. We made these gargoyles in one class period, they dried and the next class we painted them with black and white paint "sponged" onto the surface to simulate granite/concrete/stone. Every student had a successful gargoyle, and it was the only time the word "ugly" was allowed in art class... because gargoyles are ugly. I gave each student a tennis sized ball of the clay. We then used our thumbs to pinch open a mouth. We used our hands/fingers/knuckles and simple clay tools to create the eyes, ears, horns, fangs all with the pinch/ poke/and pull method. They were not allowed to add pieces to their clay, pinching and pulling only. (I have had trouble with some air dry clays using the score/slip method of attachment... so the pinch pull method solved that issue). When the heads were sculpted, they had to add texture to the gargoyles skin. When they were dry, I had dollops of black and white paint for each student. They applied the black and white paint to the sponge, tap tap tap the excess off on a paper towel, then they tap tap tap the color on the gargoyle. The sponge technique helped to accentuate the surface texture. The sponges gave the gargoyles a mottled effect, looked like stone. When the paint was dry, I used a basic Crystal Clear Acrylic Spray Paint (outside) to the finished pieces to give a gloss finish. Students could also paint on a clear gloss varnish with a brush when they are dry. Sharpie marked for their name and year on the bottom of the gargoyle head. Present students with work of several pop art artists (Claes Oldenburg is a good one). Show some of Wayne Thiebaud's work. Provide students with pictures of food (find pictures in gourmet magazines). Students make several sketches of what they want to make and develop a plan. Select the best idea for project. Make clay food. Be sure to hollow forms to prevent blow-ups. Ice cream balls can be hollowed from the bottom - or made a pinch pots and a straw hole made where they are fused to bowl or plate. 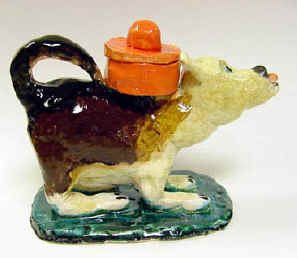 Weezie Johnston used Underglazes and specialty glazes. Everyone did the underglazing first and fired it on, then they put shiny glazes over the fired on underglazes. She found "fudge sauce" brown, "Pie crust" underglazes, "Brownie" underglazes, "cherry red" fluxing underglaze, and "whipped cream" specialty glaze. It's kind of tricky keeping the kids straight about NOT putting shiny glaze over unfired underglazes, and NOT applying underglazes over a glaze, but if they just know that underglazes have to be fired separately and prior to applying any shiny or matte glaze, they got it straight. So, some of them left their pie crust matte underglazes, brownies were matte underglazes. Note from Judy: When I used underglazes, we had success applying gloss glaze over them (when underglazes had dried) then firing. Students were just careful not to lift the underglaze when they applied the shiny glaze. This cut down on the amount of firings necessary to finish the projects. This project could be done with Sculpey , Air-Dry Clay or Model Magic . Students can make their own shoes - life size - or maybe design a shoe for an entertainer. Show are made by the draped slab method. Newspaper can be used for support then removed before firing. A discussion of shoes stimulate ideas - What do shoes tell us about our culture? Linda has a book of shoes that can inspire ideas. These are made by slab construction. 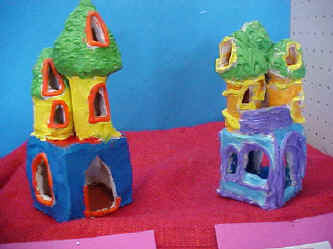 Students can make towers by wrapping clay around a cardboard cylinder. Two by fours can be used for forming too. Students make a drawing of their house/castle design - then make templates for cutting the sides and roof. See Lesson Plan on Incredible Art Department. Sixth graders used a combination of slab, pinch pot, and coil construction with clay. These Russian Basilicas were created in three 50 minute class periods. Students were required to use arches in their windows and doorways, and use at least two onion domed spires in their construction. These were painted after bisque firing. Make sure holes are cut in roof when spires are added. 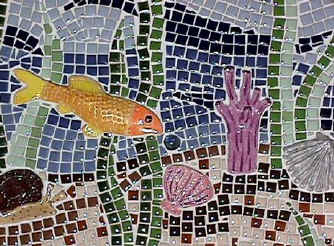 These mosaic murals were created by the eighth grade class 0f 2001. Each student researched and drew a gold fish, seashell and/or coral which was then re-created in clay. These fired and glazed pieces were glued to plywood panels and surrounded by 3/8" (8.9 mm) tiles in a variety of blues (for water), greens (for seaweed), and tans (for sand). Bubbles were created by gluing iridescent glass bobbles rising from the mouths of the fish. 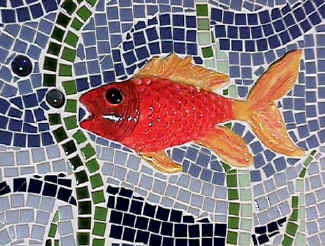 The mosaics make standing in line for a drink an interesting adventure! During the school year of 1993-94, the eighth grade class constructed our first permanent piece of art work for the school. 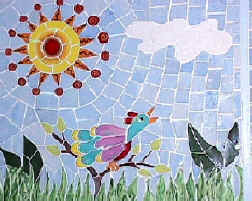 This 4' x 12' (122 x 366 cm) ceramic mural consists of three panels and is installed above the main stairwell of the school. Each tile was hand cut from a rolled slab of clay, fired, glazed for color, and fired again. The tiles measure approximately 3" x 4" (7.6 x 10 cm). (Rebecca installed the tiles over a one week period at night, covered it during the day, and had a special unveiling to kick off Cathedral School's annual art show. Students made two matching pinch pots. Small pieces of clay are wrapped in paper toweling (to prevent from sticking to bowl shapes) an put inside the small bowls. Fuse the two pinch pots together. Paddle/pinch to desired shape. The air inside will hold the shape. Add on to the shape (animals are fun for all age children. Food would be another good subject). Once finished - poke a pin hole or two through to the inside so air can escape. Bisque fire. Cynthia's students finished their rattles with watercolors then clear gloss. High school students might be given the assignment to make a cluster of three rattles - all relating to one another. For example, I saw one student make three realistic gourds (different shapes). One lesson plan I particularly enjoy (and it's one of the student's favorites) is a clay room with 7th and 8th grade. I show them how to roll a slab and cut three squares (approx. 4-5 inches [10 - 12.7 cm]). These are allowed to dry slightly and then assembled into a corner with a floor and two walls. Scoring and slipping the edges and also pressing a skinny coil into the inside of the joint is important. This is very technical for them and many of them struggle with getting their walls to stay attached and stand up straight. Sometimes they start over, but most are successful. They are very motivated to get past this initial part because then they can creatively design and furnish their rooms. I include texture in this assignment and require them to use texture some where in their room. I have been amazed how much they enjoy this project in spite of the difficulty in getting the walls to work. They do bedrooms, kitchens, game rooms, bathrooms, and I have had some really unique ones like a bowling alley, a baseball diamond, an airplane interior (with a wing on the side), a theater stage and a horse stall. They really get into the details. They are fired once and then painted with acrylics. Here is quick one day project - thumb masks Start with a ball of clay smaller than a ping-pong ball. Add a depression with your thumb (hence, the name). Pinch a nose or beak shape. Depress eyes and mouth with fingernail or small sticks (gold tees work as a nice two ended tool). 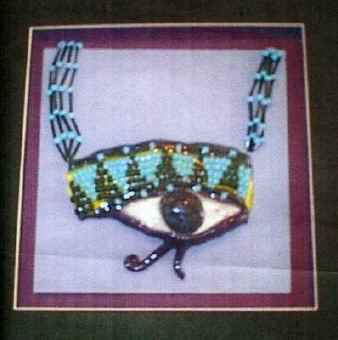 Add designs, if desired (Present a little history of masks... African, Native American, etc.). Add a small hole to the top so that it can be used as a pendant on a heavy cord. After bisque firing, we spray painted them black, gold, or silver and then rubbed with a contrasting color into the depressions. Air dry clays - or polymer clay could also be used. Show students a variety of modern teapots. Students make sketches of ideas and plan how to form. Begin form by fusing two pinch pots together. Plan for pour spout - keep hollow, lid for filling and handle for making pouring easier. These are functional, sculptural pieces. Linda shows a PowerPoint of different birds and birds in art. Student make sketches. They begin by making a small pinch pot nest - texture with tools - smooth off top rim. Linda demonstrates some simple forming techniques for birds. 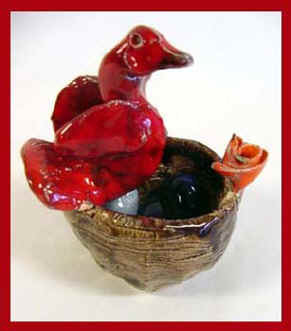 Students make fanciful imaginary birds - or realistic birds and score and slip to rim of nest. Eggs and baby birds fill the next. Flowers and leaves adorn the rim (optional). 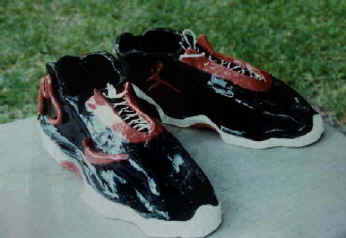 Examples are glazed. 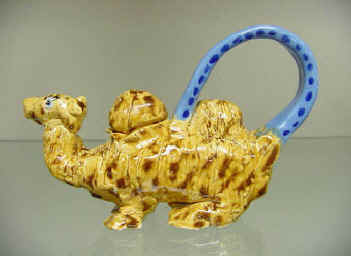 Underglazes or paints may also be used. 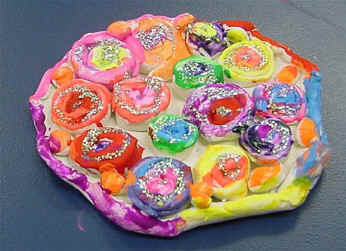 From Sarah: I do a texture/pattern clay lesson with my first graders. I have a lot of "found" materials out and we start off by practicing and experimenting making texture and pattern with different materials. When they've worked out what they want want to create texture with they press their clay flat and mold it into a Styrofoam bowl lined with plastic wrap as separator (we re-use these each year - they just have to be careful not to press too hard or the bowl will crack). When they have the clay in the bowl mold, I show them how to pinch off any extra clay around the sides and from there they create their own texture and pattern on the inside of the bowl. 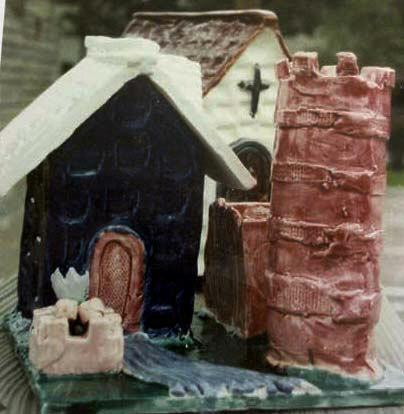 By using a mold the lesson only takes one class period to build and the texture and pattern makes them all unique. After the bowls are fired we either glaze or paint them with Watercolor Paint . This lesson is begun the same way as Jeryl's Owls. Roll out an oval slab of clay - cut off the one edge (this will be folded up). Press textures into the clay slab. Turn over - score and slip sides - fold the slab up to form a pocket (straight end is folded up). We had little cardboard tubes that we use to make sure the pocket formed. Texture the top rounded part above the pocket. Put a hole in for hanging. If time remains, they could add relief elements to the pockets. Little clay flowers - whatever. We got these done in one class period. We finished then with an oxide stain that we brushed on then wiped off to remain in textures - then glazed. We used earth tones for glazes. Glazing was all done in one class period. An elementary ceramic lesson I did was with small coils and balls of clay. 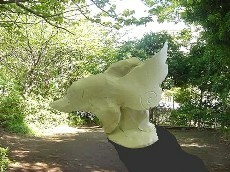 The sculpture stood around 5" (12.7 cm) at the most. This was done with first and second grade. They first make a ¼" (6.4 mm) pancake" slab base for the coils to be attached. Then roll several coils and balls. The coils need to be plastic enough to twist and turn. The students begin to bend and curve the coils leaving negative space. The small clay balls are added. All is attached with slip and paper is placed in the negative spaces to help hold it up (paper can be left in as it will burn out). After firing paint with watercolor. They make wonderful non-objective sculptures as well as learning about coils and positive and negative space. A project I did one time was Clay Hands. We rolled out slabs and traced around the students' hands and cut them out, then they could move the fingers around, if they wanted to, or just leave the hands flat and smooth out the edges. Once the hands were bisque fired I had the students paint them in a way that would tell me something about them. One student liked cows so she painted a cow pattern. Another liked baseball so he painted his hand to look like a baseball. And so on. They really had fun with these, and there is the added bonus of having their hand preserved in clay, so to speak. For middle school through high school adaptation, roll our thick slab of clay. Cut out hand. Shape hand into desired pose. Prop up fingers if necessary with wads of newspapers or scraps of clay. Build up palm of hand and add knuckles. Shape wrist and portion of arm by rolling our and fusing a cylinder of clay. Hollow out thickest part of hand and attach to wrist section. Tie in art of Rodin - expressive hands. Bisque fire - then paint to express "self" - or an emotion. 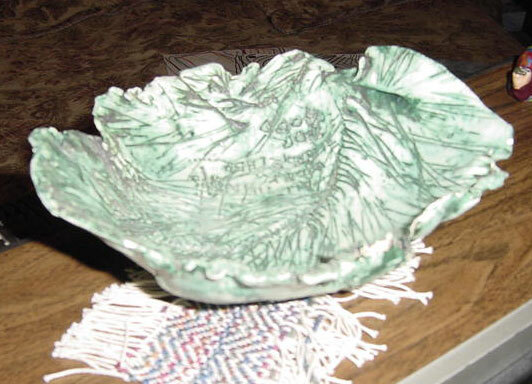 When we make drape bowls (I usually do it with 5th graders) we take a rolled out slab of clay and cut the edges into an odd-interesting pattern then mold the bowl over the students bent kneecap-you sort of throw it on there and then shape it. The students love this and think it is very fun! You can put clear wrap over their jeans or if you are brave just slap it right on the jeans or on a bare kneecap for artwork you can really get into! You can build a foot to put on the bottom out of a coil of clay. We let them dry on the shelf upside down over a wadded up ball of newspaper. It is also interesting to show the difference between a "natural" bowl made from rough edged clay and a "styled" bowl made when you trim the edge with a knife in a more controlled manner. Most students are naturally attracted to the cut-precise style and it is a learning experience for them to think about the edges just being natural. Some like to put something on their kneecap to add texture - like wadded up clear wrap, burlap, bags that fruit come in, lace etc. Example shown has pine needle textures. Students create a macquette sculpture in clay. 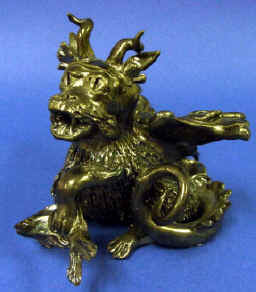 This would be a model for a larger bronze cast, for instance. 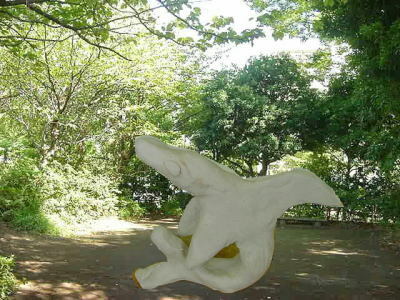 Students take photographs of landscape around the school grounds and design their sculpture to place in that location. Nature is good inspiration for this lesson. Grounds for Sculpture is an excellent resource for sculptures to inspire. This lesson could also be done with air dry clays, Model Magic or firing Moist Clay . ROLL UP THE EDGES OF THE DOUGH TO FORM THE CRUST. PLACE THE STICKY BUNS ON THE CRUST & PRESS SLIGHTLY TO ADHERE. FILL THE CRUST WITH STICKY BUNS. WITH THE REMAINING CLAY, CREATE THE CRUMBLE TOPPING AND PUT ON TOP OF THE STICKY BUNS. 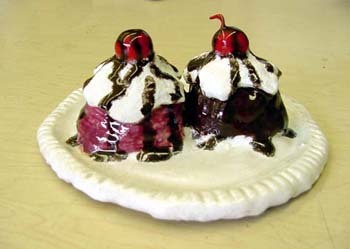 (IF THERE IS ANY LEFT OVER CLAY, USE IT TO MAKE SMALL BALLS OF CLAY AND FILL IN AREAS SURROUNDING THE "STICKY BUNS". NOTE: Example is NOT by Denise's student work - this is a photograph Denise took of a high school example. Details to come. Copyright free designs may be found in Dover Publications - available for many different cultures. Handbuilt Ceramics - Triplett offers a guide to basic techniques, from pinch pots to slapwork, with color illustrations of tools and techniques and instructions for eight projects of planters and pitchers. Slab-built Ceramics - The slab-building technique for creating ceramics has been around for centuries and remains a popular construction method for artists today. The basic aspects and astounding versatility of slab-building is unveiled in this lushly illustrated survey. Ceramics: A Potter's Handbook - This classic handbook introduces students to the fundamentals of the ceramic arts, beginning with a comprehensive history of ceramic materials, techniques, and practices up to the present day and then moving to a detailed presentation of ceramic techniques from the most basic to the complex. Pinch Method: (suitable for grades 3 - 8): but I have done this with 1st grade too. Knead Sculpey for a minute to condition. Roll into a ball. Push thumbs into the center to form opening. Pinch sides lightly and evenly to hollow out. 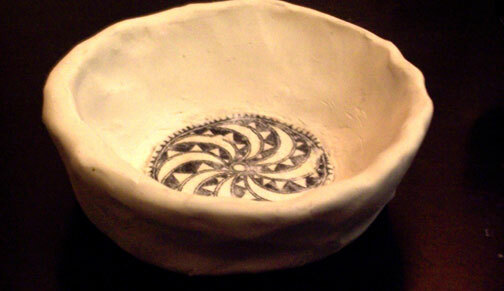 Form into a round or oval bowl. Keep walls and base l/2" (1.3 cm) even thickness (based on one slab (4 oz. or 113 g) of clay). If less clay is available, reduce thickness and size of pottery. Walls can be smoothed with fingers prior to baking, or sanded after baking. If a textured surface is wanted, this can be done with a variety of simple tools that can be pressed into the clay before baking (e.g. plastic fork, plastic toothpick, comb, screening, screw and nail heads, etc.). Coils, dots, and other shapes can be pressed onto surface for relief designs (roughen surfaces first to have better adherence). Bake at 275° F. (l35° C.) for l5 minutes for smaller pottery (2 oz. or 57 g). For larger pottery with thicker walls, (4 oz. or 113 g), bake for 25 - 30 minutes. Note: Laser printer toner, Xerox (copy machine) toner, will all transfer to the Sculpey clays. Inkjet images will NOT transfer. If you use an inkjet printer, take a Xerox copy of the image or design page, and use that for your transfers. Roll a sheet of Sculpey to l/8" (2 mm) thickness. Choose design from transfer sheet and cut out and place face down on the clay. With fingertips or a roller, press so that all of the design areas have contact with the clay. LEAVE PAPER IN PLACE and bake the clay sheet on an oven-proof glass baking dish for l0 - l5 minutes. (rubbing alcohol onto the back helps release ink) Avoid scorching as clay is rolled very thin and may cure quickly, but do not under bake or it will be weak. Let clay cool completely before handling. Then, very carefully peel off the photocopy sheet. Because of the thinness, the clay will have some flexibility. Use sharp scissors to trim excess clay from around the design border to form a patch. The patches can be applied to the actual pottery with heavy, White Glue or silicone glue . (The teacher should apply the silicone glue). Hold patches in place on pottery by securing with masking tape. Do not place tape directly on the actual design, as it may be damaged. Protect it with a sheet of paper. Two or more motifs from the same origins may be used together on one pottery piece - i.e., a border design and a major design. K: The learn to make pinch pots and they decorate them with stamped on patterns using various sticks and stamp shapes. Animals: Looking at small models of animals (lots of different kinds) kindy kids make zoo animals and glaze them. They are quite primitive but WONDERFUL. Parents crave these! 1st grade: They make rabbits to go in a mothers day gift basket that has various other things put in from their classrooms. 2nd grade: They make clay birds nests with birds, babies, and eggs in them. Some kids even make a tree branch to perch their nest on. Some of these are on our website. 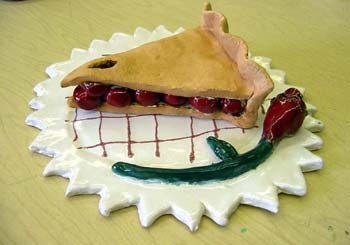 3rd grade: Sometimes we make clay storytellers based on Native American storytellers. They are made with an upside down pinch pot as the body, added on legs, etc. Some of these are on our website. 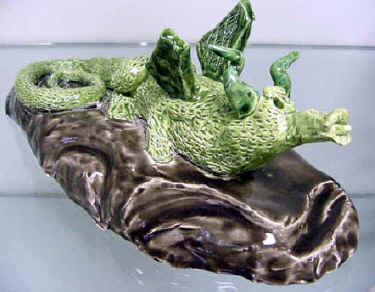 One of them recently won the youngest merit award at NCECA's National K-12 ceramics exhibition. Other years we might do one of the following projects: Effigy vessels - based on Peruvian clay effigies. 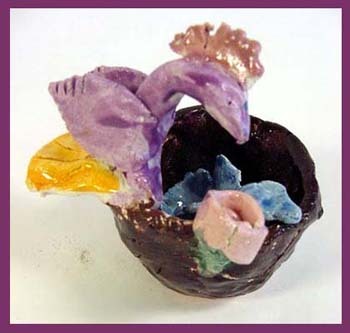 Kids make pinch pot bowls and add on animal heads and legs to make a little flower pot or vase. Or they might make a small covered jar and put an animal on top as the lid. 4th grade: Clay figures in action. This years group had a wonderful group of Robin Hood type figures made by a group of boys. Other things were kids playing instruments, doing gymnastics, curled up with a book, playing with pets, etc. 5th grade: Hollow clay animals or gargoyles (kids choose). Students have to draw as realistically as possible, what they want to make. Then we lay a sheet of tracing paper atop their drawing. Students diagram in cross section how they will build their animal with pinch pots, coil, slab, pinched or modeled form, and where the air vents will need to be. These plans are approved and discussed. I demonstrate many ways to use coils as reinforcement, to add detail on the faces and musculature, we discuss air issues in clay in great detail, and we discuss in great detail the ways to handle clay as they are building it to avoid problems with trapping air. I model a lot of situations for them in my demonstration. These are on our website. None of them broke! I am really pleased with the progression of our clay curriculum. By the end of 5th grade, kids really do know a lot. They love working with clay and they are comfortable doing it. Because we start with the basics and teach clay skills from the very beginning, our kids learn to work with clay at a young age, and they learn through experience how to handle clay to avoid problems as they go. Some learn through experience, but they do live to tell about it. Most of those kids will come in at recess on a few days to remake their project if it is dropped or if it cracks big time in the kiln, etc. This year I had some kids experience shivering of underglazes. That was rough. I HATE it when that happens! Next time we use underglaze, I am going to have kids paint on a base coat of a safe color like yellow or pink. (those colors never shivered off.) We'll paint all of our other colors over those. The colors that shivered off were fine if they were not used as a base coat. Live and LEARN. The kids that this happened to were disappointed, as I was. We chipped off all of the loose glaze by tapping on it with a screwdriver while wearing goggles. Then we used watered down paint mixed to the same color and patched the chipped off color. We put clear nail polish over the paint and it looks fairly decent and blended in pretty well. Not exactly glaze, but looked close enough to save the piece. In my opinion, kids learn more than they experience tragedy with their clay pieces by a long shot. To deprive them of the opportunity to create those fabulous little primitive masterpieces as K, 1, 2, 3 kids is unthinkable. The excitement we feel as we open our kilns after a glaze firing is singular to clay. It's always a surprise, and it's so much fun. Parents probably cherish the clay pieces as much or more than any other projects we do! Teach your kids to deal with problems, and teach them why they happened. 4. Air bubbles are your enemy. 5. Nothing should be thicker than your thumb. Pinch Pot Pets. The process is so simple and all of the creatures come out differently. Students begin by forming a small pinch pot. The sides are then squeezed in so that the opening of the pot kind of resembles an 8. The top of the 8 will form two front legs. The bottom of the 8 will form two back legs. Now, turn it over. The bottom of the pot now becomes the back of the pet. By pinching and pulling, students "find" the head and tail of their animal. I tell the kids the animal will show them what it wants to be. We have had horses, dogs, dinosaurs, dragons, cats, etc. Students get ideas from each other and some students put a lot of effort into details. I caution them about having details that are too small (fragile, dry and fall off). After firing, Students paint their animals with Acrylic Paint . Some paint realistically, while others paint fantasy animals. Art Education Listserv brainstormed pinch pot ideas in response to a question by a first year teacher. Below are lesson ideas and tips. 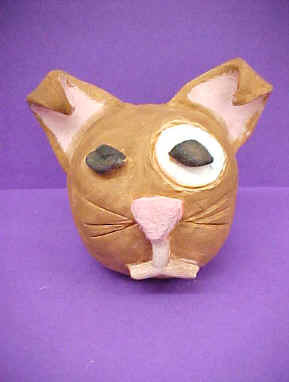 If the students make a pinch pot and turn it over it can become an animal's body - just add a head, legs and tail and texture (also see Pinch pot animals idea above and pinch pot effigy lesson plan). You can teach pinch and score/slip technique in one class. If you want to keep things simple for your first ceramics lessons you could stick with a simple pinch pot. Read a book about the Japanese tea ceremony and serve tea in the finished glazed tea cups. You could make pinch pots and burnish them when they are leather hard too. My fourth grade loved doing that, we did a Native American connection. We used the back of spoons and polished river stones from Wal-Mart's artificial flower section. I do the thumb mask lesson idea from the Incredible Art Department with 4th grade and they love it. If you start small you can work your way up to larger, more time consuming projects as your comfort level teaching clay increases. Pinch pot turned over for body - see Lesson Plan. I have my students (2nd grade) make clay shakers. They make 2 pinch pots, then roll about 4-5 small balls of clay and wrap them in paper towels. They put the balls into one of the pinch pots and then attach the two pinch pots together with a coil of clay. They then incise decorations into the clay. They love their little clay instruments and can't wait to take them home! Note from Judy: natural organic forms are good motivation for this lesson. See image on this advanced lesson plan. 1. Curve your hands into the letter C, like parenthesis around your clay, and shape it into a baseball or meatball. 2. Stick your thumb more than halfway into the ball, but not so far that it comes out the other side. 3. Keep your fingers together and your thumb inside the pot, pinching and turning like a crab or lobster to make the hole bigger. 4. Gently tap the clay down onto the table so the bottom surface becomes flat. 5. Dip one finger into the water and polish any "elephant wrinkles" (the kids love this terminology and remember it from year to year) until they are smoothed away. 6. If you want a circular shape, repeat step one like you are giving your clay pot a little hug with your curved hands. If you want an oval shape, gently squeeze it in like a bathtub. If you want a square or rectangular shape, put one finger into the corners to help form the 90 degree angles. If you want a triangular shape, do that in two corners and squeeze the other side into a point. 7. Bend down eye level to see if your pot is the same height all around it. Make sure the top of it is smoothed, because that's usually the first thing people will notice when they look down at it. 8. If you want to create a lid, flatten out a piece of clay that is bigger than the pot. Turn the pot upside down on the clay. Trace around it and cut out the lid. Smooth the edges. 9. If you press something into the clay for texture, make sure you keep a few fingers inside the pot for support so it doesn't cave in with the pressure. 10. When you write your name on the bottom of the pot, hold the tool straight up and down (instead of slanted like we hold a pencil or pen). Print the letters larger and farther apart than you think you need to.